There are no remains of the Ballykeal Cross, only the site thereof. Henry Pelham included it in his map of the area in 1782, and Charles Blake-Forster in his notes on Kilfenora in the 1870s mentioned it, but said that its head and arms were broken off. The site of the cross, with its raised mound, is just south of the stone wall that divides the paddock and lawn fields, south of Ballykeal House. The site is unknown to many people but an event in 1988 brought it to prominence. Fachna Mellett [then owner of Ballykeal House], while working his tractor accidentally unearthed a flat stone thus revealing a skeleton. The skeleton lay on its back facing the east the hands laying by its side. It had a full set of teeth. It was excavated by officers of the Office of Public Works who took the bones to Dublin for dating. The radio-carbon date for the skeleton contents was given as approximately 400 A.D. Ordnance Survey Map, Sheet 9, 2nd ed. Site of Ballykeal Cross marked as ‘Standing Stone (Site of)’. 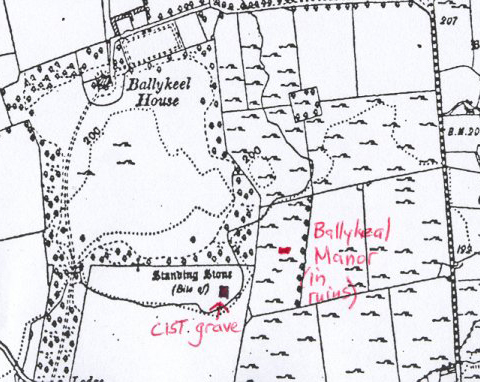 The newly-discovered cist grave and Ballykeal Manor are marked in red. This was 32 years before St. Patrick came to Ireland, so was this a Christian burial as Christianity was much in evidence at this time? This cist grave is only about one hundred yards to the east of the site of the cross, and there is a local tradition that another grave was found when they were constructing the Ballykeal water course which is nearby, but nothing was recorded at that time, so one wonders why was this site chosen for the cross, which is about a quarter of a mile or so from the cathedral.